If you do not yet have a 23andMe Health Report, you can ORDER ONE HERE! 23andMe TESTS for genetic ‘SNP’s’ that they are not allowed to REPORT to you. 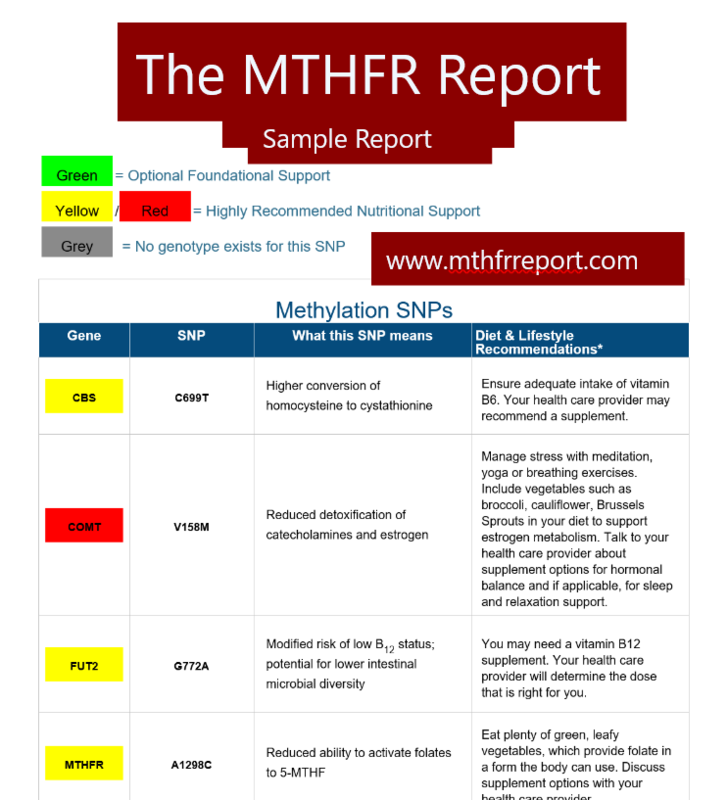 We can provide you with a report on these ‘SNP’s that 23andMe includes in their ‘raw data’, but that they can’t report it to YOU! Click below to see a sample report. Single Nucleotide Polymorphisms (SNPs) are common genetic variations that explain many of the differences between individuals. Knowing which SNP’s you have allows us to generate a report that tells you which SNP’s you have, and gives you specific nutritional recommendations tailored to your individual genetic code. What SNP’s Does the Report Contain? It contains the following SNP’s that were chosen based on the fact that they are well-researched to be clinically relevant and that have actionable nutritional interventions. In other words, if you have these SNP’s and they are causing you problems, we actually give you actionable nutrition strategies you can start doing right away. It’s all provided on a FULLY SECURE HIPAA compliant server. Your personal genetic information is never at risk! Researching supplements is confusing and time-consuming. But we’ve done all the hard work of researching supplements for you. You don’t have to spend hours looking through tons of confusing supplements and figuring out what and how much you should take. Everything is simple and spelled out for you exactly, so you don’t have to think about it. And it’s all provided at no cost to you. Just sign up below, and in 1 to 2 days, you’ll get your ‘invitation’ to upload your 23andMe Raw Health Data into the secure server, and you’ll immediately have access to your reports. Later (in 1 to 2 days), we’ll send you personalized supplement recommendations so you don’t have to do any research yourself. Eliminate your worry and confusion. We’ll tell you exactly what you need to do to customize your health to your genetics. You’ll need your 23andMe RAW DATA to get this report. Follow These Instructions to Download Your Raw Data. Don’t worry, it’s very easy to download this file. PS. Do not ‘unzip’ or ‘extract’ the file before you upload it to us. We need the entire zip file just as it is when you download it from 23andMe. Copyright 2017 by The MTHFR Report.